487 pgs, 2003, Facts On File, Inc.
Meant to inform while inspiring, this book is an excellent reference resource. 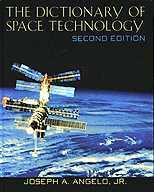 Updated to incorporate the recent advances in space technology terminology, the Dictionary of Space Technology contains more than 3,000 concise entries. Topics include: basic concepts, theories, historical events,and expected future events.